Truck driving can be a lucrative occupation, but it is also taxing on the body. You’re seated inside a truck for most of your day, are likely eating a lot of fast food, and are exposed to extreme weather conditions. However, if you make sure to exercise regularly, eat a relatively healthy diet and keep yourself hydrated you can keep your body in peak condition despite the rigours of the profession. Truck drivers sit. A lot. This can be bad for your back. Fortunately there are certain exercises you can do specifically for your back and neck. Back bends and Front bends are one of the easiest exercises you can do without any need for equipment. To perform a back bend, simply place your hands on your hips just behind your back. Lean back and hold this position for five to ten seconds before returning to your original position. For the front bend, place your hands in the same place as you would for the back bend (on hips behind back) then lean forward. Hold for ten seconds and then repeat up to five times. It sounds like this minimal effort would lead to minimal results, but in doing so you’re stretching your muscles, which lessens tension and the possibility of injury. Pushups are also a great option to maintaining health on the road, but you have to do them properly in order to get optimal results. Lie in a plank position with your hands placed just beyond the width of your shoulders. Lower your body until your arms are at a 90 degree angle, and return to the original position. Having proper upper body strength is ideal for maintaining control of your truck, as well as having the ability to complete any necessary roadside assistance that includes handling heavy tools. It is always good to eat a healthy snack right after you exercise, and every few hours on days that you don’t. 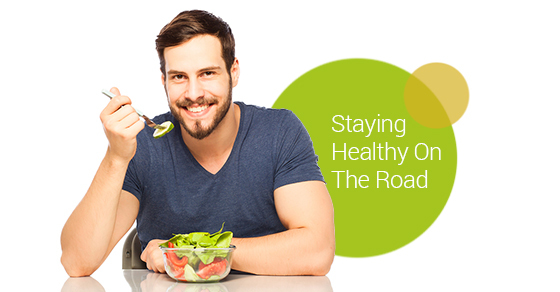 Fruits and vegetables are good to carry along with you for extensive rides. Start each morning with a fresh, home-cooked meal if possible, and if you do eat at a fast food restaurant, be selective about which ones you eat at. Surprisingly places like McDonald’s and Subway do have healthy options on their menu. McDonald’s has a McMuffin option that is low in fat and high in protein, and Subway also has multiple low fat sandwiches that you can eat without the worry of gaining weight. The most important thing to keep in mind is movement. If you’re pulled over for a delivery, take that as an opportunity to stretch, walk, and generally move. The more active you are during these downtimes, the more able you’ll be to maintain your overall health on the road.